For those less familiar with online marketing, a landing page, also called a lead capture page, is the page which appears when you click on the results provided by a search engine. The landing page is usually the most relevant from the whole website, relative to your search. The landing page is the first contact the visitor has with your website, so it needs to be visually attractive and informative in order to keep the user on the website and to gain a new customer. Landing pages are an important part of an online marketing strategy and the effectiveness of such pages can be measured so you can adjust your future development plans. 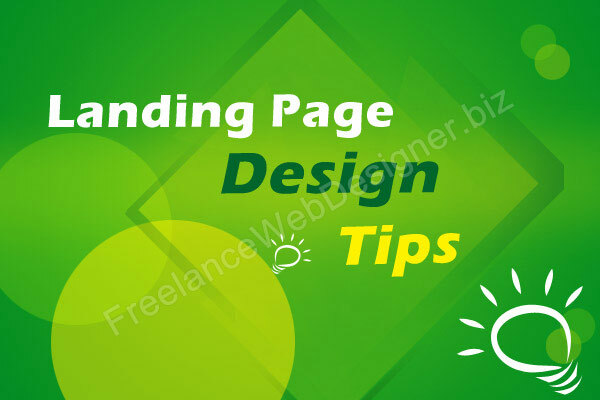 So, what a professional freelance landing page designer should keep in mind are a few tips to obtain a successful outcome of his work. When web design and marketing meet, the objective behind delivering a great landing page design is very well formulated – attracting more customers. The prospective customer needs to be encouraged to act according to your interests. The offer and the call for action section must be emphasized and the user should be aware of what will happen if he/she takes action. Even before arriving on your landing page, the visitors were having a certain need or interest in their mind. If you know what they were looking for, you can create and edit the content on your website such as to satisfy the possible customer. Don’t distract the user’s attention with unnecessary information, such as too many fonts, colors, redundant media content, misleading images. Instead you should help him focus on the goal of the landing page. It has been demonstrated that landing pages featuring less content have a higher conversion rate. Too many images are just as superfluous as too much text, which people never read. Images need to represent a real support for the product or service they promote. A few pieces of advice would be keeping things simple, avoid repetitive images, choose the perfect format (not to small, not too large and loading slowly). The idea is to use the image for your purpose and give it the right place; you don’t want it to monopolize the page and to eclipse the other important contents. If you feel your landing page lacks credibility, a good idea could be adding some value to it with the help of well-known brands. These brands could be payment methods, money-back guarantees, trade associations, on condition that they have a real reason to be featured on your page. Also testimonials of previous customers will improve the conversion rate of your page. Social media has proved its utility as a powerful weapon the last years – it brings visitors to your web page, it helps your website to be more SEO friendly, it builds reputation. Make sure you have share buttons on your web site or you can use signing in through social networks accounts. No matter what kind of product you are about to launch, either a cleaning product or a great landing page design, in your case, you need to test it. A professional freelance landing page designer will focus on the features of the page he/she can test before releasing it and receiving feedback from the client. This is great – I just started looking into landing page strategies. Nice post and straight to the point – thanks!